Femi pairs his detail-oriented background in the chemistry lab with a passion for protecting client innovations. Femi began his career in chemistry and approaches legal work with the due diligence of lab testing. To assist clients in solving a legal matter, he systematically examines whole business systems to find the root of an issue and then strategically address the task at hand. He defends clients, such as global pharmaceutical, wireless telecommunication, and electrical and computer engineering companies, in various intellectual property (IP) matters. 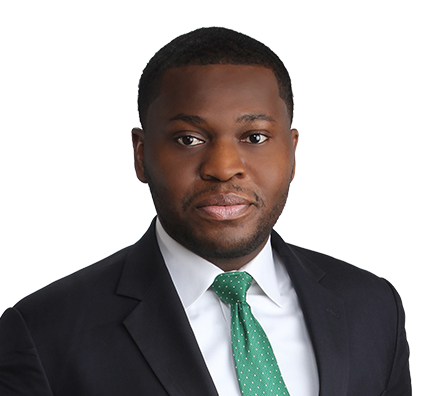 Clients turn to Femi for counsel on patents and trademarks, copyright infringement, and Food and Drug Administration (FDA) regulatory and compliance cases against state boards and federal government agencies, as well as for antitrust cases. He analyzes a wide range of patent and compliance issues, drawing from his prior experience as an examiner in the U.S. Patent and Trademark Office. Femi appreciates that litigation and IP work is different each day, and as unlimited as a client’s imagination. Drafted and prosecuted patent applications directed to wireless telecommunication technology, medical devices and biotechnology. Led comprehensive regulatory and data privacy compliance analysis (HIPAA, COPA, COPPA, PCI) for complex pharmaceutical and wireless telecommunication organization with multifaceted outreach/e-Commerce programs, resulting in comprehensive and integrated compliance program. Review and analyze chemical and pharmacological data for purpose of assessing noninfringement or invalidity positions, including single crystal X-ray diffraction, NMR and IR data. Deposed FRCP 30(b)(6) witness of global pharmaceutical company; defended technical expert witness in patent infringement litigation; second chaired litigation depositions. Research state and federal case law pertaining to Food, Drug and Cosmetic Act, and conduct document review and analysis for purposes of assisting in preparation of witnesses for deposition in Hatch-Waxman Paragraph IV litigation. Developed discovery strategy and document review protocol, and managed all aspects of discovery and document production in connection with complex patent infringement matter, involving damages claims in excess of $1 billion. Femi and his sister are avid runners. She often registers him and herself for races in Chicago, including the annual Shamrock Shuffle celebration and the Hot Chocolate 5K. Femi says he’ll never forget his first pro bono case. He obtained a more than 70 percent reduction in fees for a single mother renter in a landlord-tenant bench trial. That his legal skills could impact someone’s life so dramatically was rewarding, and he looks forward to similar casework. He also volunteers annually for the Cook County Bar Association Job Fair.